The natural forces on the Earth can be categorized into two sections: constructive and destructive. Constructive forces are those that work to build or create new formations. 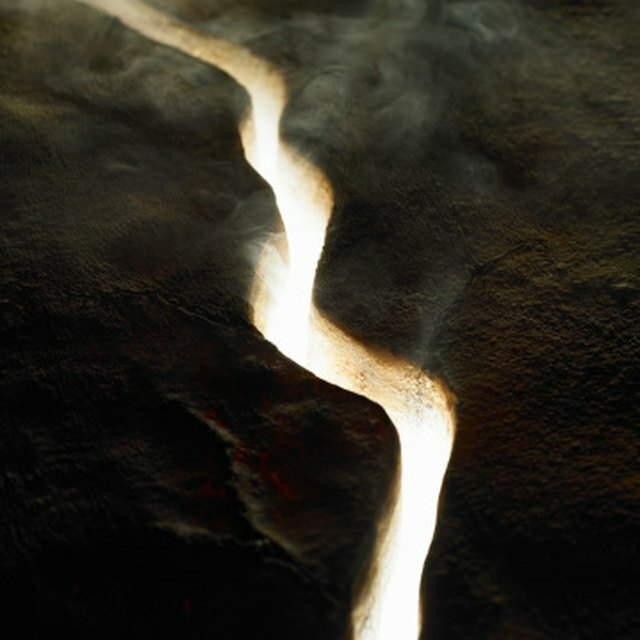 Destructive forces, as the name implies, destroy or tear down existing formations. Some forces qualify as both a constructive and destructive, in that they harm the existing landscape while simultaneously creating a new one. 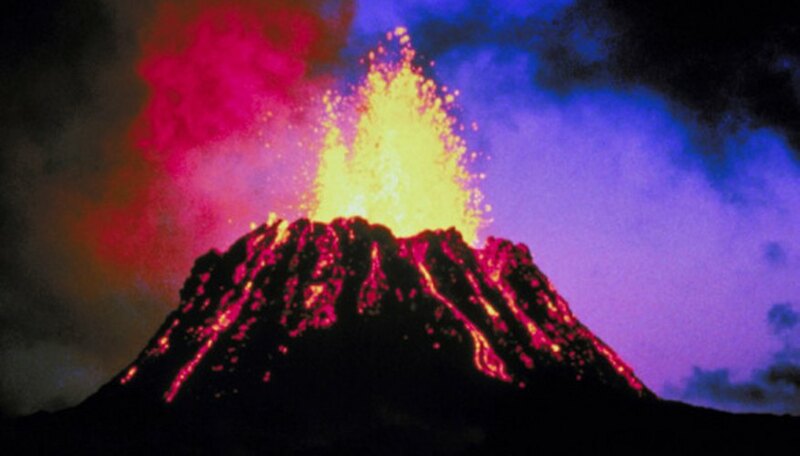 Common constructive and destructive forces include volcanoes, erosion, weathering and deposition, and many others. You will need two empty two-liter soda bottles, a washer with a 3/8-inch hole in it and some electrical tape. Fill one of the bottles two-thirds full of water. Place the washer on the mouth of the bottle, then place the mouth of the second bottle on top of the washer. Use the electrical tape to tape the two bottles together with the washer firmly in place between them. Flip the bottle assembly upside down. The water from the top bottle should slowly drip into the bottom bottle and possibly stop flowing completely. Move the bottle assembly around in a quick circular movement several times and then place it on a solid surface. As the top bottle drains into the bottom one, a funnel will form. This activity works best if you divide your students into teams of two. Each team will need an empty Styrofoam cup with three small holes (approximately half a centimeter) in the bottom, a cup of water, a baking dish, some dirt, rocks and pebbles. Begin by having the students mix the dirt, rocks and pebbles together in their baking dish. Each group should then form mountains along one edge of the dish. Remind students to pack the dirt firmly when creating their mountain ranges. Next, one student holds the Styrofoam cup, his fingers blocking the three holes, while the other student pours the cup of water into the Styrofoam cup. Holding the Styrofoam cup over the newly-created mountain range, the first student unplugs the holes and allows the water to pour, simulating rain. The students should closely observe the process and be ready to relay to the class the effects the rain had on their mountain range and where erosion and deposition took place. This experiment can be done on the same day as “Rain, Rain, Go Away,” since it uses many of the same materials. Divide the students into groups of two. Each group will need a baking dish, a cup of water, dirt, rocks, and pebbles. The students mix the dirt, rocks and pebbles together in the baking dish. Each group should add a little bit of water to their dishes, just enough to pack the dirt tightly. Using his finger, one member of each group should trace a river bed into the dirt. The river can be any shape (straight, curved, braided and so on), but it must reach from one end of the dish to the other. One student holds the dish at a 45-degree angle while the second student pours water into the head of the river bed. The students should observe what happens to the shape of the river and the river banks as the water flows from one end of the river to the other. For an additional activity, the students can place pebbles in the river bed and observe the new direction the water will take when the original path is blocked. You will need a large map (preferably on a cork board), three different colored stick pins and Internet access or various books about volcanoes, earthquakes and tectonic plates. Divide your class into three groups. Assign each group to research one of the following areas: 10 famous volcanoes, 10 famous earthquakes or the boundaries of the Earth's tectonic plates. Allow the students to use the Internet and/or available books to find the locations of the items in their category. Give each group a set of colored stick pins, one color per group (for instance: volcanoes, red; earthquakes, blue; tectonic plates, yellow). Once the groups find the locations within their category, they should mark them on the map. When the research is complete, students will most likely discover that many of the volcanoes and earthquakes occurred along the boundary lines of the tectonic plates. Many young people are becoming fascinated with creating their own videos. There's no reason why you shouldn't take advantage of that fascination. Instead of assigning a report to your students, allow them to create a PowerPoint presentation to share with the class. Assign a topic to each student or allow them to pick their own. The topics can be based on constructive and destructive forces themselves or on specific land formations that have been created due to constructive and destructive forces. You can decide how long the presentation should be and what information you want them to include. Beyond that, allow your students to use their imaginations to create an educational and entertaining presentation. Rongione, Dana. "Activities for Teaching Constructive & Destructive Forces on the Earth." Sciencing, https://sciencing.com/activities-constructive-destructive-forces-earth-8516441.html. 24 April 2017.